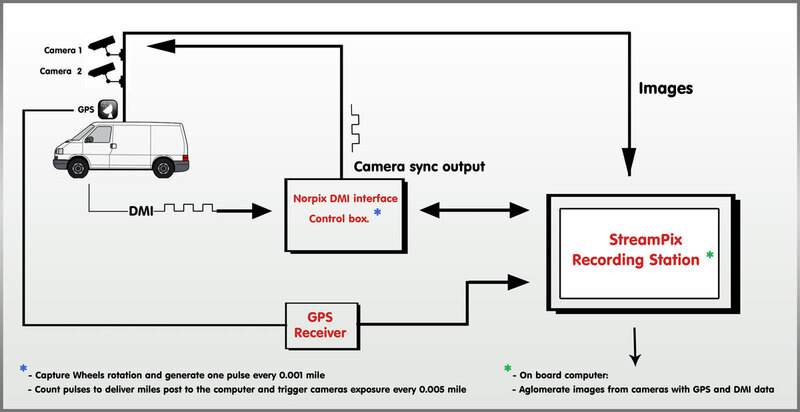 The Distance Measuring Interval Module is capable of controlling image capture rates for multiple cameras based on the received information from a Pulse Distance Interval signal (PDI). Furthermore, current GPS readings and current milepost information can also be gathered during the image capture and recording process and embedded with each image. A software module for StreamPix. An electronic counter device (usually plugged in to the image recording computer). Sync box that allows connecting various input and output signals together. A Pulse Distance Interval signal usually provided by a DMI device or wheel motion encoder (not provided). A NMEA compatible GPS device (not provided). One or multiple cameras for image capture. The DMI module requires the usage of some internal electronic counter devices directly plugged into the computer. Supported devices are the Measurement and Computing 4301LS, the National Instruments NI6601 or NI6320 devices, which include some counters and IO control. The sync box needs to be connected to the host computer via the provided ribbon cable. DMI Input: That connector must receive the PDI signal from the wheel encoder. The PDI signal must be a TTL (0-5V) square wave signal. Pulse rates depend on the motion speed of the vehicle. Camera Sync Output: That output has to be connected to each camera trigger input. It will control each camera exposure based on a divided rate from the input rate. Red LED: When on, that indicates the sync box receives appropriate power from the computer. Green LED: The LED will be flashing at the rate of the PDI. No motion will generate no pulse. Note that in order for the pulse to be visible, you may need to adjust the duration of the pulse via configuration of your DMI device. The LED is directly connected to the input line. If the PDI pulse duration is very short (a few milliseconds for instance) you may not visually see those. PDI pulse duration may be too short for the naked eye. However, the NI device will still be able to properly handle pulses with durations as short as 50 nanoseconds. White LED: The LED will be flashing each time a capture signal is sent to each camera. When the LED is off, no image is captured. The module can be loaded via External Module Docking panel. 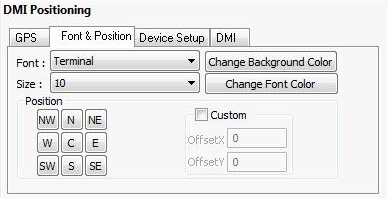 Select "DMI Positioning" and click Load. Once loaded, the module will need to be setup properly via various tabs. GPS related information will be setup via the Device Setup tab. Overlay information font and position can be setup via the Font and Position tab, while information related to the DMI control and camera sync will be set via the DMI tab. 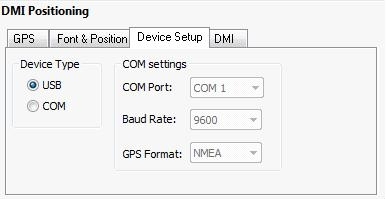 Select the Device Setup tab to configure information related to the GPS device. Select connection port USB or COM(rs232) as well as COM port parameters. Check with your GPS device for adjusting the parameters. All NMEA compatible GPS are supported by the module. Once the GPS related parameters are properly configured, you can switch to the GPS tab. If images are capturing images, GPS information will be refreshed in that panel. In that panel, the module allows the user to choose which information will be decoded from the NMEA string sent by the GPS device. Latitude, longitude, altitude, speed, bearing and time can be decoded. Depending on the GPS device, not all information may be transmitted. Check with your GPS provider in case some information cannot be displayed. Since NMEA compatible GPS devices usually deliver a new message every second, this information is refreshed every second. As a consequence, all frames received between 2 messages will be stamped with the same and constant information. The Save GPS data to file can be used during recording. It will create a comma separated text file (.csv) that stores the selected GPS information along with the index of each image. The file is created in the same folder as the recorded sequence, AVI, MOV or image files and uses the recorded file name with a "_gps.txt" extension. If the destination media for recording is RAM rather than disk, the file is created in the C:\temp folder and is called “RAM sequence_gps.txt”. 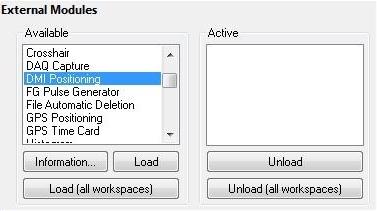 If a File Name Padding value is specified in the StreamPix settings > More...> Images page, then that padding will be applied to the image index in the GPS text file. 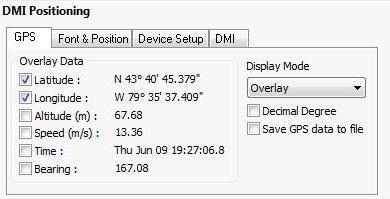 It is possible to control the Display Mode for the GPS data: it can be "burned" on each image or simply be overlaid (no damage to the image data). You can specify the font type, size, position and location in the image via the font and position panel. Predefined positions are available. Eventually, you can also select Custom and enter pixel coordinates to set the exact location of the text in the image. Various fonts and sizes are available. Please note that the font size may look different when using the Overlay mode versus the burn to image mode. In overlay mode, zoom factor applied on the image display has no effect on the display font. All information related to the DMI can be setup within that panel. Miles per Pulse parameter defines the DMI incremental distance between each pulse. Refer to your DMI device documentation to enter the right value. An incorrect value will affect the MilePost calculation. Initial Miles: At the beginning of a data logging campaign, an initial mile post value can be entered. MilePost will increment according to the received DMI pulses starting from that initial value. MilePost: When enabled, the MilePost value is stored with the GPS collected data. If display mode overlay or burn to image is selected, MilePost value will be added. If Save GPS data to file is enabled, the .csv file will also contain the corresponding milepost reading for each image. Reset: At any time, the MilePost value can be reset to the initial mile. DMI pulses are directly linked to the travel distance of the vehicle. Image capture is synchronized with DMI pulses. Adjusting the Trigger camera every N Pulses value allows to define the camera capture rate according travel distance. Make sure to enter a proper value, compatible with the campaign image sample rate, vehicle maximum speed and camera maximum capture rate. Finally, the DMI Module can accommodate various hardware devices mounted into the computer according to your configuration. Make sure to select the proper DMI input device.